The MG TF/ZR/ZT and Rover 75 are not the first former BMC>MG models to be manufactured in China. The original production lines for the Morris Marina and the Austin Maestro were also sold to the Chinese and, ironically, both ended up in different factories located in the city of Chengdu. I reckoned that was reason enough to visit Chengdu and discover what had happened to those production lines. The Marina’s tale is a short one: I didn’t find a single Marina, Marina van or pick-up in the streets of Chengdu. The old FAW factory has long since been closed and demolished. The social unrest at this backward factory had led in to an unprecedented demonstration on the Chengdu streets in 2003 and that gave the regime good reason to close the factory and fire the workers. No, there is nothing left of the Chinese Marinas. The Maestro-line was first sold to a tobacco company in Shandong province, named Etsong (or Yizheng in Chinese). That company managed to produce a small series of Maestros and Maestro vans but, in 2003, the line was sold again to the Chengdu-based Sichuan Auto Industry Group Company Limited, which produces vehicles under the Yema brand. Sichuan Auto is a very small company with a long history of building strong SUVs in extremely small quantities – they are, though, particularly suitable for the rough roads of South West China. A visit to a small manufacturer like Sichuan Auto is not easy. Nobody speaks English but, more importantly, people don’t understand why there is foreign interest in their factory and products. When one tries to make an appointment, there is always the promise to call you back, but they never call you and emails are not answered. There is only one solution: just go there. Sichuan Auto lies 30 km from the Chengdu city centre, in a large industrial area, and not far away from a new Volkswagen complex. The factory has two divisions: left a bus factory, right the automobile factory. The receptionists were very friendly and, after two hours of phone calls and taking me from one office to the other, they decided that I was welcome and that the Sales Department should have the job of showing me around. 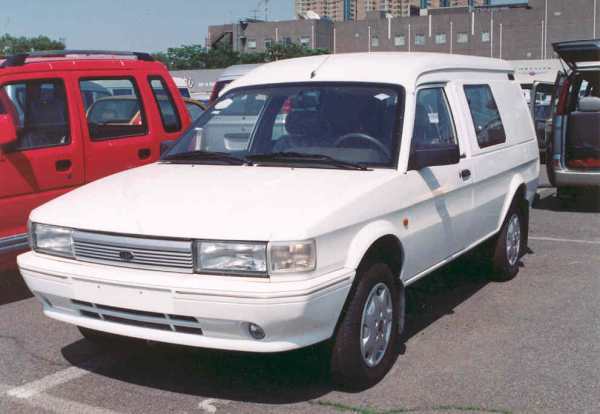 Two cars seem to be in production: the SQJ 6450N, a 4-seat van which is, in fact, an updated Maestro van (which also exists as two-seat van, the SQJ 6450) and the SQJ 6451, a small 4×2 SUV-like car based on the Maestro platform. The body of this car resembles the previous generation Subaru Forester. I was allowed to take the SQJ 6451 for a short test drive around the factory facilities. The engine sounded strange: a very high-tone noise. It is the CQ4C15 engine, which is based on the old 1498 cc Toyota 5A and made at a sister factory in Mianyang near the epicentre of the devastating earthquake of May 2008. OK, they let me walk around and take pictures. Only one strange restriction: I was not allowed to take pictures of… cars. A strange request: how to do you take photographs in a car factory without photographing the cars? I spotted two heavier SQJ 6485s in one of the halls. This model is a much bigger (Toyota Land Cruiser size) 4×4 SUV. It is not clear whether these cars are already in production or that it is the intention to produce them in the near future. Another product is the M72. This was a 2000 concept from Matra of France. Sichuan Auto is copying this concept. I counted five test models in different stages of assembly. They were completely hand-made and I was told that they were used to test different alternative-fuel engines, like CNG (natural gas, very popular in Chengdu), electrical engines and hybrids. I distinguished two different models. Here, though, I really had no chance to take photographs. The quality of the cars was poor – they were very cheaply and roughly built and no match for the competition. I was disappointed to find a clean and nice factory with a lot of potential which was seemingly being underutilised because of a lack of expertise and effective management. Very interesting, esp the faux Subaru – the windscreen and (re) skinned doors show the past, so could have ARG carried out Roy Axe’s request to lose the swage? “The body of this car resembles the previous generation Subaru Forester.” I thought when I read the text then looked at the pictures that this was indeed a Subaru Forester that the author was using to travel around in! Only when seeing the production pictures, did it become apparent that this is indeed the car they are manufacturing. An incredible facsimile. Shame to see the last of the Maestros being constructed. Like watching the slow death of a much loved friend. I recall having a new Maestro; D89 FFA – a red 1.6L with the blacked out door bottoms. I also recall travelling at around 80-90mph down the A38 dual carriageway just outside Derby (sorry officer) when I found some lunatic approaching me in my lane from the opposite direction. All I had time to do was to swing the wheel hard to the left. The car wobbled a bit but was generally unperturbed. That handling, combined with the fact that there happened to be space in the left lane to accomodate me, contributed greatly to the fact that I am here to tell the tale. If only it had been a looker … and the rear wheel arches hadn’t been made of cheese. Given the comments above re. quality, they would probably have the same problem as UK built Maestros and Montegos, of rusting from the seams outwards. I know their paint supplier told AR off for leaving unpainted shells standing over weekends. What is that green and grey thing meant to be? I think that is the M72 referred to in the text. Looks like a Smart car type thing to me. Nice article – your persistence in getting into the factory is to be congratulated! (Also useful info on what happened to the Chinese Marina/Ital factory.) I wonder where the pressings are made? Yema’s site seems to be yet another brand new Chinese factory built to a very high standard but very little sign of any components/work in progress – getting money to build and equip a factory seems to be no problem but funding working capital is a completely different issue? An interesting article, although does anyone know where I can buy an unused ‘new’ bodyshell for a Maestro car to enable me to rebuild my accident-damaged MG 2.0i, after a seller of one I had already agreed to buy from them sold it to someone else? Answers, please if you know of one. Even better if it is in the UK. Rob the plastic mini – Chile it was. Doesn’t have any press tools it was fibreglass. Laid up by hand. When the Chilian dignitaries were visiting the Cowley body office in the 1980s negotiating with the management team. they spotted Sid Horwood in the office (Elcid) they left their Rover escorts and went to Sid. he had done the original Chile mini project 20 years earlier. At the age of 60+ Sid took on this new Mini project ,making the moulds in Cowley and delivered it in Chile – with armed guard as things were not too stable there. Talk about history repeating itself…….